LG Electronics (LG) announced the global roll-out of its premium IPS7 series monitors, launching first in the Asian markets of Korea and China, including Hong Kong. The IPS7 series features LG's own CINEMA SCREEN Design, with an almost invisible bezel for an unobstructed entertainment experience and a sophisticated, modern appearance. The IPS7 series also delivers lifelike color consistency and representa-tion across a wider viewing angle, thanks to LG's own IPS technology. The addition of Mobile High-Definition Link (MHL) makes it easy to connect external devices, like smartphones, for immersive viewing on a larger screen. "By combining CINEMA SCREEN Design and MHL functionality with the industry's leading IPS technology, the IPS7 series is able to offer stunning design and performance," said J.J. Lee, Executive Vice President and Head of the IT Business Unit of the LG Home Entertainment Company. "With the rapid growth in the number of mobile smart devices such as smartphones and tablets, the availability of content has greatly expanded. LG's IPS7 expands the user experience, enabling viewers to take full advantage of this content-rich environment." Incorporation of LG's CINEMA SCREEN Design results in an impressively thin 1.2 mm bezel, practically eliminating any visual distraction and allowing for greater viewing immersion. 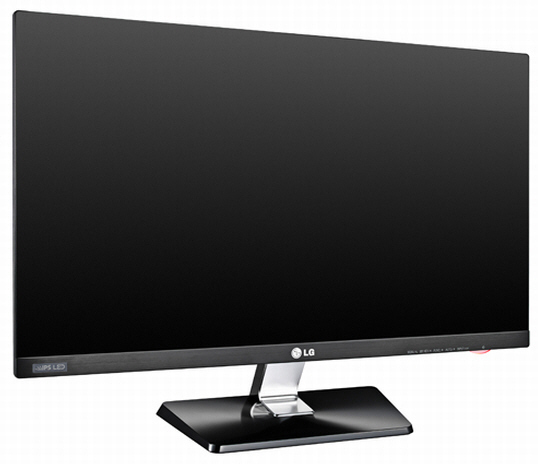 In addition to the incredibly narrow bezel, the overall depth of LG's IPS7 monitors has been reduced to a mere 14.1 mm. The streamlined metallic stand creates an aesthetically sharp profile and the cable management feature further enhances the visual appeal. What's more, traditional plastic buttons have been replaced by capacitive touch controls for a sleeker look. CINEMA SCREEN Design delivers in style what LG's advanced IPS technology provides in stunning picture quality. The clean lines and modern, minimal design add value to any space, while the lifelike colors and crisp tones add up to a visual experience that is second to none. Addressing the need for easier connectivity, LG has provided the perfect solution with today's newest technology: MHL. With Mobile High-Definition Link technology, IPS7 series owners can easily connect mobile devices to the monitor with a single cable to the HDMI input port. With MHL, photographs and movies stored on smartphones can be viewed on the larger monitor screen. The IPS7 series even charges connected mobile devices while users enjoy their favorite content. The IPS7 series uses In-Plane Switching (IPS) panels rather than conventional Twisted Nematic (TN) technology found in most monitors. This brings advantages in picture quality and color consistency, letting users enjoy the most vivid and true-to-life colors around. The IPS7 series produces an incredibly smooth viewing experience, without the blur that often accompanies rapid motion in action scenes, sports and video games. This means less stress on the eyes, even when using the monitor for an extended period of time. With improved response times when viewing motion pictures, users can enjoy the benefit of the smoothest entertainment experience around. And IPS panels excel under a wider range of viewing angles when compared to their TN counterpart. Users can play games or watch videos while sitting, standing or lying down without experiencing any color shift or distortion. A convenient color calibration function is included to help reproduce the most accurate, lifelike colors. The IPS7 series comes with LG's own software for simplifying the calibration process for professionals, such as photographers and graphic designers. 1080p? Fail fail fail fail fail. 3.5 litres of Pale Ale in 18 minutes. For an extended desktop, will this new LG monitor be able to collude with my present screen or do I need a Samsung ? Higher resolution would be great. Would love 3 of the 23" ones. the new king of eyefinity!!! Was absolutely digging this, especially the design, until I saw the resolution. C'mon LG, make 1440p@100-120Hz official. You think it being 1080p is bad? Pah, it's not even 120Hz! I mean I'm sure its a great looking panel but they coulda stepped it up and had a hit. Yeah, waiting for higher res panels to come out and drive prices down. The bezel is great, but at these prices I would expect a little bit more. Add 16:10 to it as well and it's bought. Contrast ratio.... Mega!? Really? WTH is that suppose to mean? Price... Is this one of those deals where if I have to ask I probably can't afford it? I'm in the market for a IPS monitor, and I really like the looks of this one, but I'll think I'll pass on it. The negatives are deal breakers. I need to save my pennies for one of these beauties. I hope you mean 16:10 not 10:9 thats not even a widescreen ratio. Yea that! Opps, my bad... #^%&! Dyslexia,@$^%^&*@! Satan forbid, what is yamakasi? I've missed something in the industry? Yeah, Korea makes better monitors than the rest of the world. Presumably because of Starcraft 2. This caused me to think of throwing out my very old HP LP2275W... although now it seems to be selling 20% pricey at my country when I bought it 3 years ago lol. Yeah that monitor is the next purchase for me. My 24" is nice and all but for that price and resolution it's tough to look away.